Wow, 9 weeks (no exclamation point there because I feel tired and drained today). 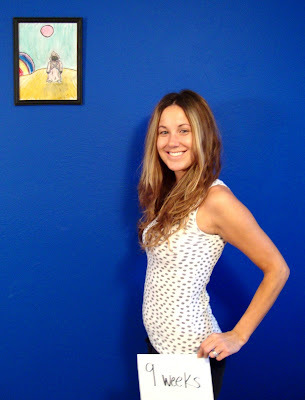 But, we are slowly moving through the first trimester! It feels like it is taking forever, but I know that when I look back it will seem like it went so fast. This week was rough because our schedule was disrupted by going back to school. I was nervous about how I was going to get enough rest in during the day, and how I was going to feel waking up at 5am. It turned out to be ok, there was one day where I felt horrible at the end of the day (too tired), and one where I felt bad in the morning. I think part of it was because I stopped taking acidophilus so I felt bad for a couple of days. I have a bad stomach and it helps if I take it, but I didn't want to take a chance with the baby so I stopped. But, after I felt bad, I did some research online and it turns out it could actually be beneficial to the baby, and me, so I added it and feel good again. This weekend was amazing because I caught up on all the naps I missed throughout the week (I slept for 11 hours and took a long nap yesterday), so it was a much needed restful break! I've already been getting some pregnancy "horror" stories from people (whether you ask for them or not). 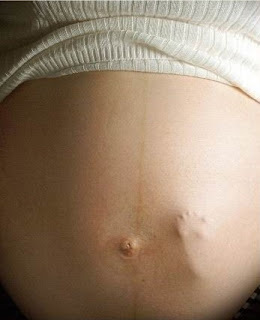 People like to say the following to you (when you are pregnant): "How far along are you? Have you been sick? Oh, that's just about the time I started getting really sick." No offense people, but I don't really want to hear about it. Just because it happened to you, doesn't mean it will happen to me, we are all different and our journeys will be different too. I'm looking forward to starting Hypno Birthing this summer because Christine said they give you a button you wear that tells people not to tell you their stories. My Obgyn said she really doesn't like when people do this either because then her poor patients come in with worried questions, just because they heard a scary story from someone else. I also have been really into reading about pregnancy through other women's views. You can have all the books (thanks June!) but there comes a point when you really want to see real pictures and read someone's real experiences. I tried looking at "pregnant models" on a few sites where people submit their pics, but this was weird and the pics creeped me out (most of them looked like the young girls I teach at school). So, I spent some time looking for blogs where women wrote about having their first child, and their experiences. Blogs where someone is in the same week as you are hard to find, but blogs where people are a bit further along or have had their babies already are out there. I wanted to find someone who was fit, healthy, was on their first baby and had pictures; and I found a really great one: Ashley's Green Life. The first blog post of hers, that I read, reminded me of me and I liked her right away. She has such great information on her page about having and raising a "green baby," becoming vegan and gluten-free. Check out her blog, it's super cute! She is 26 weeks today but has pics up since she was 8 weeks, so it has been fun to read her journey while I am on mine. A sort of bonding experience even though I don't know her, feels like we have something amazing in common. :) She also has weekly pictures up and I like it because it shows me what's in store for me in the the future. I also like that she takes a pic with her shirt over her belly and one with it up, what a great idea so you can remember what your belly looked like in clothes too! I'm stealing this for sure! I also love this shirt by Zoe B (from the blog too), I have to find it! "Start a daily ritual to connect with your baby . . . Women should set aside two five to ten minute periods a day to think about their baby. Just after waking up and going to sleep works well for many expectant moms. During these time, sit quietly and gently rest your hands on your belly. Focus on your breathing and then start thinking about your baby (your hopes and dreams, your intentions, etc.). It's a great way to initiate the bonding process and to help you plan for the kind of parent you want to be." So, I decided that I definitely want some Belly Buds so that blueberry can listen to music, and also that we should start writing letters telling our little friend just how excited we are that he/she is coming. Ian mentioned starting a blog today and I told him just to write on this one. So, as part of our letter idea, he decided that he would write a weekly letter to include on here so that blueberry would know his thoughts as well as mine. I really liked the short little notes on this blog that Trish writes to her baby, and wanted to do something similar, so off he went to write his letter tonight. 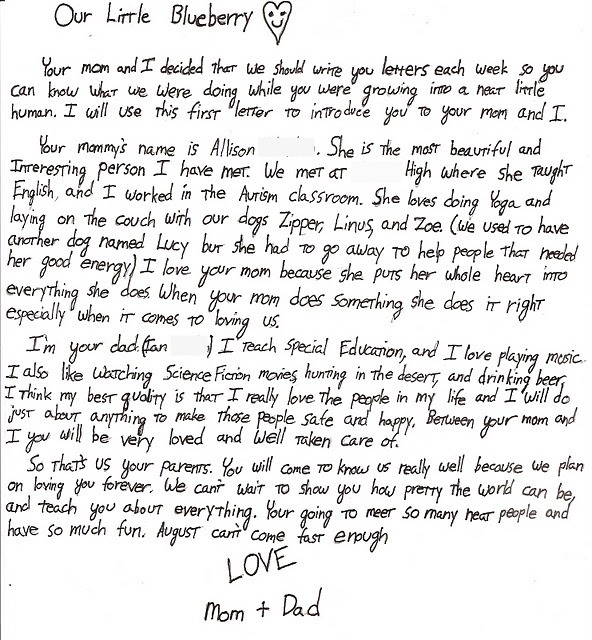 When I read his letter below, I cried. I am so lucky to have my husband, he is my best friend and the love of my life. Words cannot express just how lucky and happy I feel, we are so blessed. Everything I hope and pray for each night comes true, every single thing. Someone is definitely watching over us and we are so lucky to have the life we have together. Little blueberry, we cannot wait to meet you. We ended the night with homemade funnel cakes and a movie. What a relaxing weekend! Thanks so much for the blog shout out! You rock for mentioning my blog on here. I agree that there comes a certain time that you have to put the books aside and learn about pregnancy by finding someone who’s actually going through it. I’ve spent many Saturdays searching the internet to find other pregnancy blogs, but it’s hard to find one in line with some of my “birth beliefs” (you know…natural, healthy, positive). I love that I’ve found your blog too! 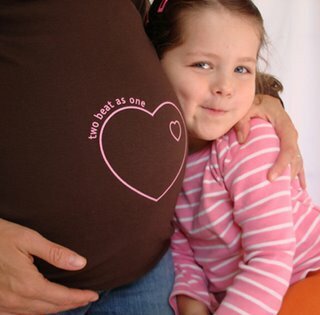 We sure have a lot in common and it will be fun to sharing our pregnancy journey together. Isn’t funny how you can have such a connection with someone who you’ve never even met, but the fact that we’re both pregnant really brings us together! It has stuck with me ever since and I really wish I had it over the holiday break because I got so many birthing horror stories it was crazy! Glad you’re into HypnoBirthing too, most people look at me like I have a third eye when I tell them about it, so I’m glad to have someone else who “gets” that birthing style. Love the letter from your husband to your baby, what a cool idea. I would have been crying too! Last, hope your energy improves! I remember feeling very tired and drained during the first trimester as well...teaching sure doesn't seem to help sometimes does it?! I was like…great, there go my workouts for the rest of pregnancy! But luckily sometime in the 2nd trimester, around weeks 15 or 16, I noticed a big improvement in my energy levels and it’s still sticking around, and my workouts are actually better now than in the first trimester! So I hope that you can feel that soon too! Okay sorry to be rambling with this mega-long comment, just lots to share! Have a good week! What is with people telling you their horror stories? I hope I am not one of those moms later on . . .
Are you doing HypnoBirthing? I am considering it only because my husband and I are really into yoga and it sounds like yoga for giving birth. A friend did it and loved it so we are going to give it a try for sure. Teaching is a hard job when you're pregnant, it's fun that you can relate. Totally napped behind my desk yesterday with the door locked, it was fun. Haven't told the kids yet but when I do I'm hoping they will be nicer to me! Ha! I am really tired all the time but feel like I push through it (probably more than I should) and am doing pretty well. I do hope I can run, not walk, again on the treadmill so I hope you're right! Only 19 more days to go til I am over this hump! Glad to be your first comment! Thanks for commenting on my posts too, I don't get many so it's nice to know that someone out there is actually reading it! Wish I could nap at school too! I don't have kids from 12 to 1 and I could see a nap fitting very nicely there in the upcoming weeks! Yes, I'm planning on doing HypnoBirthing, I've read it before I was pregnant and I'm re-reading it now and I think it really does seem like yoga for giving birth. It puts a huge emphasis on relaxation and breathing, which I think yoga really helps with! We start our 5 weeks of classes (every Sunday for 2.5 hrs) this Sunday, so I'll keep you posted. Let me know if you want a copy of the book, I have two...already had one and then got one when signing up for the class. I'd be happy to send it to ya! You are so sweet for saying you'd send me the book, thanks! I actually have a copy I got from a friend and haven't even read it yet, just have done my own little bit of research online and from another friend. Have fun at your classes, let me know how they are! We won't be taking ours until this summer so I would love to hear about it! Glad you've got a copy of Hypnobirth...such a good book! I've been re-reading it lately and giving Brandon the "cliff notes" as we prepare for our class on Sunday-hehe! I love the Life in Transition blog too, her camera takes amazing pics of her little guy! I like the page where she organzies all of her pregnancy stuff. It inspired me to organzie my blog like that so now my "green baby" tab at the top is "green pregnancy". Wish I could figure out how she got all of her weekly pics together like that...photoshop? Any ideas? I'd love to do that with mine! Thanks for the blog reccomendations, always love finding a good pregnancy blog!